50 x 400mg Veg. Caps. A source of youth and vitality? This is the question that many worldwide scientists have been asked about bee pollen and propolis, substances from which bee bread is made. Researchers in Russia have investigated the long living people of the Caucasus region and found that most of them were bee keepers too poor to eat the clear honey, which they sold locally, they however ate the scraps of honey and pollen (bee bread) found at the bottom of the hive. It was concluded that eating these scraps, which were almost pure pollen was the reason for their longevity. Carlson Wade writes in his book Bee Pollen and Your Health, "Two of the greatest gerontologists of the USSR, professors Nikita Mankoysky and D. G. Chebotarev, have also found that pollen is able to cause self-renewal or rejuvination and add years to the life span." 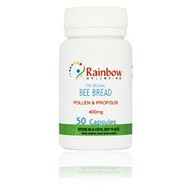 100% Pure Wild Flower Bee Pollen and harvested raw propolis capsules. A super food supplement, the ingredients have helped people of all ages to greater health and fitness, including athletes. 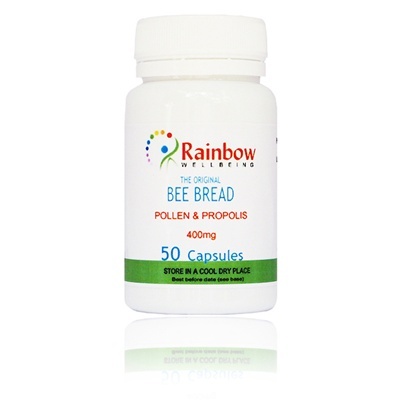 Ingredients: 100% pure wild flower bee pollen and raw propolis. 100% pure wild flower bee pollen and raw propolis.